To recap, Phase I of my long overdue kitchen refresh was honing the shine off the granite countertops, re-grouting the marble backsplash and installing new, modern faucets (see here). 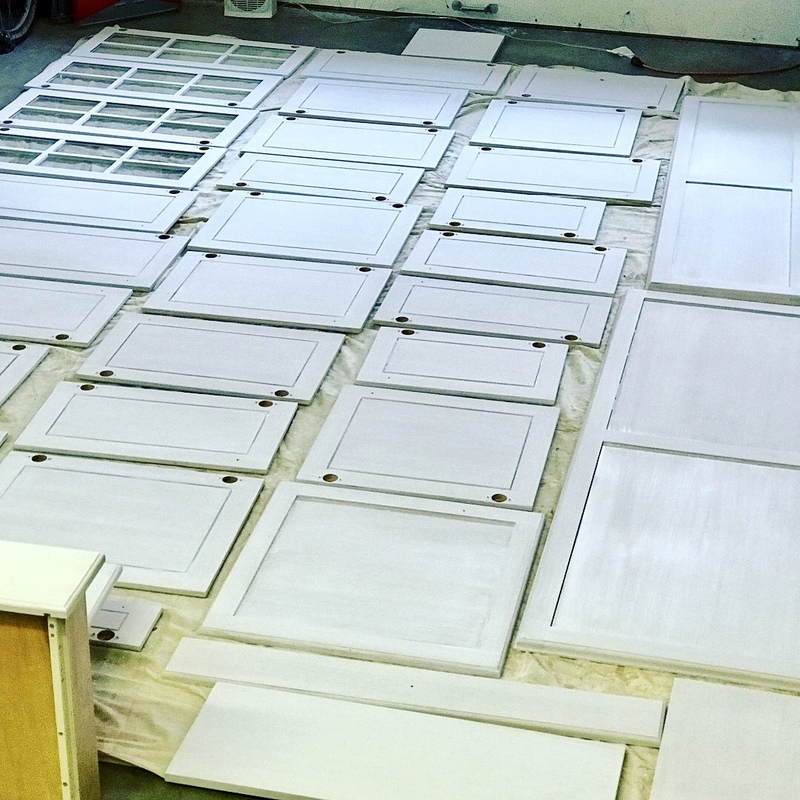 Phase II is painting all of the kitchen cabinets Farrow & Ball “Joa’s White” and putting new nickel pulls on all the cabinet doors. I chose these pulls for our bar cabinets when we added it to our kitchen in 2016. Thank god they were still available for this phase! They are made by a company called Schwinn. Hmmm, nice scratches in my wood table. This is our bar. We are matching the kitchen cabinets with the same paint color and pulls around the corner. Another view of the bar. Refreshing the kitchen to match this will make the whole space look MUCH bigger. Doors off and everything out of the cabinets in preparation for industrial primer. I took this opportunity to get rid of a TON from our kitchen. Threw out anything we haven’t used since we moved in here and, trust me, there was a lot! Primer going on. It already looks lighter. I was happy to get rid of all the wood, but kind of felt guilty painting over it. I know the people who owned the house before us put in really high quality custom cabinets, which allowed us to keep them. They are still in amazing shape. No turning back now, the primer is on everything. Just hoping I am happy with the finished product! First coat of Joa’s White is on the upper cabinets and I LOVE IT. All of the drawers painted and the new pulls ready to go on. I had to get a few different sizes of pulls based on the width of the drawers. Since the drawers are all different sizes, I chose a pull length that was roughly 1/3 of the drawer width. I was worried that a variety of sizes would look weird, but you can’t tell now that it is all installed. Before and after. Why didn’t I do this 10 years ago? Here are pics of the kitchen painted and all doors back on… So much brighter and contemporary looking. We used our favorite Mrs. Myers scent (radish) and scrubbed the inside of every drawer and cabinet so they are spotless and smell divine before everything goes back in. It feels like a whole new kitchen, for a fraction of the cost. As I said before, we were really lucky because the custom kitchen cabinets are a superior quality and in great shape. The paint just helped update them. Here we are with everything back in, right before we hosted Easter. You can see the bar around the corner from the refrigerator. Now that everything matches, it gives the room a uniform feel. This is our breakfast nook. You can get 8 or more around these two marble bistro tables. That is it! We are thrilled with the results. The whole project took about two weeks, give or take. There were a few glitches, which is expected. But nothing that was serious enough to hold up the schedule. We spend so much time in the kitchen, it is a pleasure to have it look and feel so fresh. We also threw out so much old stuff, the cabinets feel really organized and functional. For now! Verona, Bologna, Parma – oh my! Looks amazing, Liz! You have such an eye! Thank you so much. I really do love it. Feels really fresh and new and didn’t break the BANK! I would love to do that project!!!! I liked this kitchen refresh part 2. You are doing an amazing job. Thanks for sharing this post. Thank you for sharing this….Can you recommend who painted your cabinets? Looking to do the same at my sons condo and this is perfect!